A fire at an adhesives factory was caused by static electricity, investigators have found. 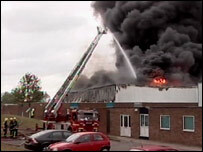 The blaze, at Caswell Adhesives in Corby, Northamptonshire, destroyed the building and engulfed part of the town in thick black smoke. More than 35 firefighters had to be treated in hospital after breathing in chemical fumes. An investigation has found that a discharge of electricity ignited combustible vapours.